System Restore: timetables revert to pre-School Holiday times. Throughout the borough, most of this autumn’s service changes entail the reversion of summer timetables to schooldays timetables. For once, a fairly quiet autumn. There is only one notable change and these affect the 236 and 237 routes’ Sunday and Bank Holiday services. Stalybridge and Ashton-bound 237s will leave Shirebrook Park Estate five minutes later than at present. Therefore, buses will depart at 25 past the hour instead of 20 past the hour. From The Norfolk Arms, 28 minutes to the hour. In the opposite direction, the 236 will leave Ashton-under-Lyne bus station at four minutes to the hour instead of one minute past the hour. Please note: the above changes apply to Stagecoach Manchester’s journeys. MCT Travel’s evening journeys on the 237 route are not affected. On the 205, the weekday 0840 journey from Denton to Piccadilly Gardens will depart from Crown Point at 0845. Additional early morning journeys from Ashton-under-Lyne have been added to another Piccadilly Gardens bound route, the 216. Perhaps it is providing a serious alternative to Northern’s rail ‘service’. 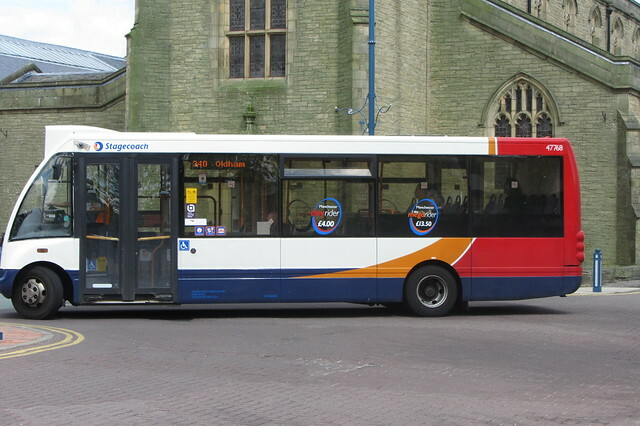 Other timing based changes have been added to Stagecoach Manchester’s 220 and 221 services. Likewise with First Greater Manchester’s weekday journeys on the 389. In the last TfGM Bus Subcommittee meeting, there has been talk over the possibility of adding Waterton Lane to the LocalLink network. This followed a comment on the omission of the said street on the 353 route (see the Summer 2018 changes). Furthermore, cuts are planned for LocalLink services with early mornings and late nights being phased out. Also, we have found out about forthcoming changes to the 341 service from Hyde to Glossop. In a bid to improve reliability, it has been suggested that off-peak journeys would omit Grange Road North in favour of Stockport Road. Peak hour journeys would retain their link with Grange Road North. If accepted, these changes will take effect from the 29 October.